Cambridge academics have signed an open letter calling on the University to “reject” the recommendations of the divestment working group report and to commit instead to full divestment within five years. Detailing the “unsatisfactory aspects” of the report, the letter claims that the working group’s advice “represents a transparent attempt to thwart the direct and positive action of divestment”. At the time of writing, there were 61 signatories. This divestment working group was set up in 2017 to examine the “advantages and disadvantages” of divestment. Their report was presented to the University Council earlier this month, with the Council still continuing discussions on whether to commit to full divestment. The letter criticises the “insulting” claim that those involved in the campaign for divestment “do not understand” that “not all of the University’s investments are direct”, arguing that it was the report's “decisive point in the case against divestment”. The working group report justified its position of ‘considered divestment’ in arguing that by joining the Institutional Investors Group on Climate Change (IIGCC), the University would be able to shape a transition to a low-carbon economy more directly with fossil fuel companies. The “validity” of the report’s assumption that “for the time being fossil fuels will remain part of the energy mix” is also called into question, with the open letter arguing that suggestions of a longer time-frame for transitioning to renewable energies is “a betrayal of current and future generations”. It is also claimed that the report contains “no assessment of the extent” of the University’s collaborations with fossil fuel companies or funding received from such companies. By not stating any such interests explicitly, the letter claims that the objectivity of submissions received by the working group, and therefore its conclusions, may be “seriously compromise[d]”. The open letter claims that the report “emphasises the University’s obligation to maximise the return on its investments”, claiming that an indirect investment strategy enables institutions such as Cambridge to “distance themselves from the ethical consequences of their investments”. Several of the report’s proposals are criticised. Signing up to the United Nations Principles for Responsible Investment is called “little more than a smokescreen” which “protects institutions from confronting their ethical responsibilities”. Dame Athene Donald, the chair of the working group, did not respond to the specific allegations made in the open letter. She said that their report “took evidence from all sides of the debate, including University staff and students through open meetings”. She added that the group was comprised of members “with a very broad range of opinions”, noting that they have “spent the last year considering this complex issue”. 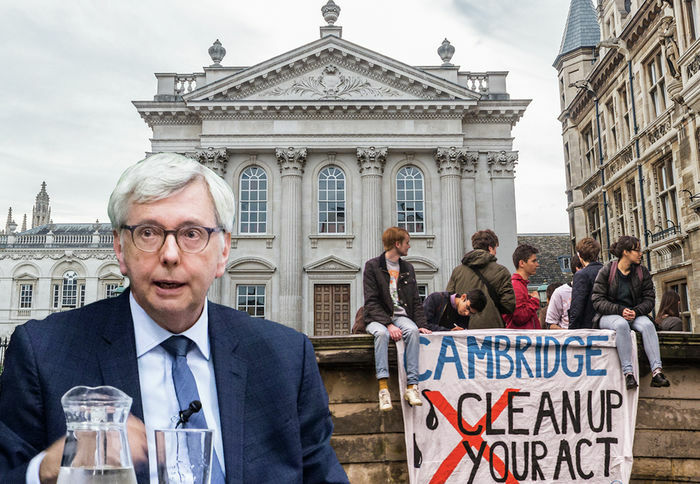 In response to the working group report, Cambridge Zero Carbon Society have continued their direct action, aiming to push the University to commit to complete divestment. Yesterday, the group staged a triple banner drop across the River Cam, chanting and releasing vibrantly coloured flares.